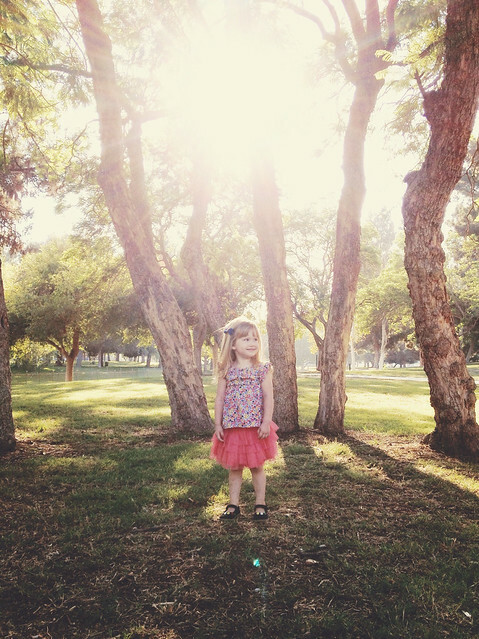 Today, Eisley is officially three years old. As is always the case, I can't help but wonder how the time has gone by so quickly. I still remember so vividly when she was just a tiny nugget who felt the need to reside inside what was essentially my ribcage, kicking me all day long and keeping me company during the long commute to and from work. I remember the first night I spent with her after she was born, how I couldn't sleep more than an hour, unable to stop admiring the perfect shape of her incredibly tiny ears, stroking the soft new skin on her shoulders. I remember bringing her home—Jay and I laughing over how we actually missed her while she slept so soundly in her new crib. I remember the first days after Jay returned to work, and it was just Eisley and I all day long. The fear, the excitement, the exhaustion. I remember the first times she smiled at me, her eyes turning into sweet little crescent-moons. I remember my worrying so much about her reaching (or not reaching) milestones at the perfect times—rolling over, clapping her hands, saying her first word. I remember freaking out when she started scooting toward the remote control at 5 months, and taking her first steps at 9 months. I remember cutting her bangs for the first time and it going terribly wrong. I remember the night wakings that continued long past her first birthday. I remember her first favorite dolly, when she decided on a favorite blankie, when breakfast cereal became her favorite food of all time. I remember falling in love with her personality more and more as time went on. Her silliness, her curiosity, her sweet spirit. I remember how excited I was to see the same creative spark I have, in my daughter. I remember when I first started to realize I could have an entire conversation with her, when she started playing make-believe, when she started to really test the limits of our patience. I remember when she first pointed out a letter on a park bench, and I realized that she was listening to what I taught her more than I even realized. I remember her learning to sit through an entire church service without throwing a fit. I remember all the family adventures we've had together. Airplane rides, Disneyland days, ridiculously long road trips. And now, there's this little girl in front of me who is much more little girl than wee one. She's our little Eisley-girl, our chickadee, our cheeky monkey. She's always on the go, and makes everything more exciting. She continues to adore books, princesses and puzzles. She's become more of a social butterfly in the past year, always eager to make friends and play with kids everywhere we go. Although she looks more like me, I see equal parts of my personality and Jay's personality in her, which I love. She loves dance parties in the living room, pretending to be a mommy with her dolls, and going anywhere new. Her long, shiny hair and natural highlights are a little ridiculous in the best way—and she currently prefers to have them in two braids or one (depending on whether she wants to channel Anna or Elsa). Watching her play make-believe has to be my favorite part of this stage, and it truly brings me back to my own childhood. Pretending to be a doctor, a bride, a gymnast. Truth be told, she tests my patience every single day, but she also has changed my life for the better—and continues to do so, every single day. As they say, motherhood is the most humbling, sanctifying, beautiful thing. I'm grateful to have a sweet girl of my own, and try to always realize how lucky I am to be her mama. I tell her she's my favorite Eisley in the world, and that is definitely the case. I can't believe my little girl is three! I can't wait to see what she what the year ahead holds for us as a family. Here's to many, many more adventures. I can just smellllllll the fresh air in that pic!! Happy Birthday E! My son turns 3 this month as well. Fastest three years of my life! This is just so sweet, happy birthday Eisley! Aww!! Happy Birthday Eisley! I've enjoyed watching you grow. This seriously gave me chills! It's so amazing how fast time flies by with little ones. Hope your sweet little girly had an amazing third birthday!